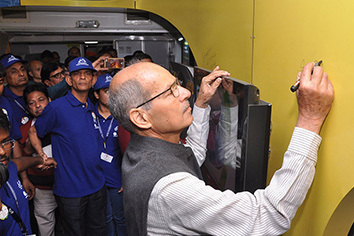 Science Express is an innovative mobile science exhibition mounted on a 16 coach AC train which has been custom-built for Department of Science & Technology (DST) by Indian Railways. This unique mobile exhibition was first launched in October 2007 by DST. It has since then made eight tours of the country, travelling about 142,000 km and exhibiting at 455 locations. Over its 1602 exhibition days, Science Express received an overwhelming response from 1.56 crore visitors. Science Express has become the largest, the longest running and the most visited mobile science exhibition and has six entries in the Limca Book of Records. 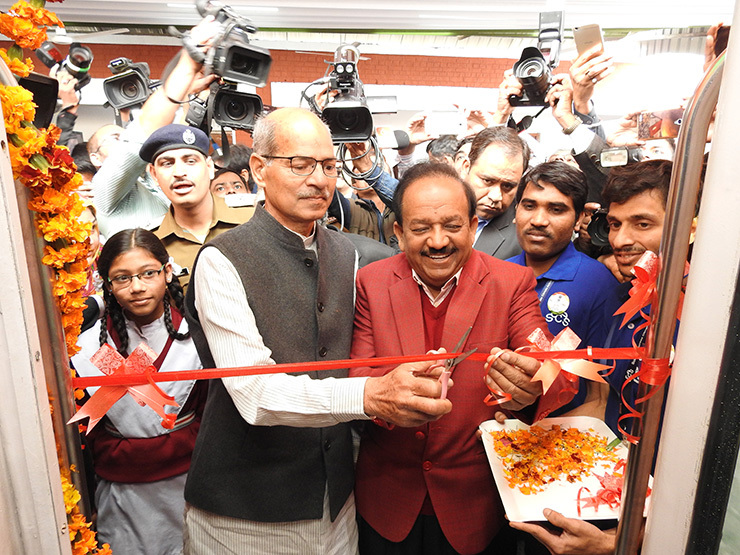 Science Express Phase I to IV showcased cutting-edge research in Science and Technology being carried out worldwide. 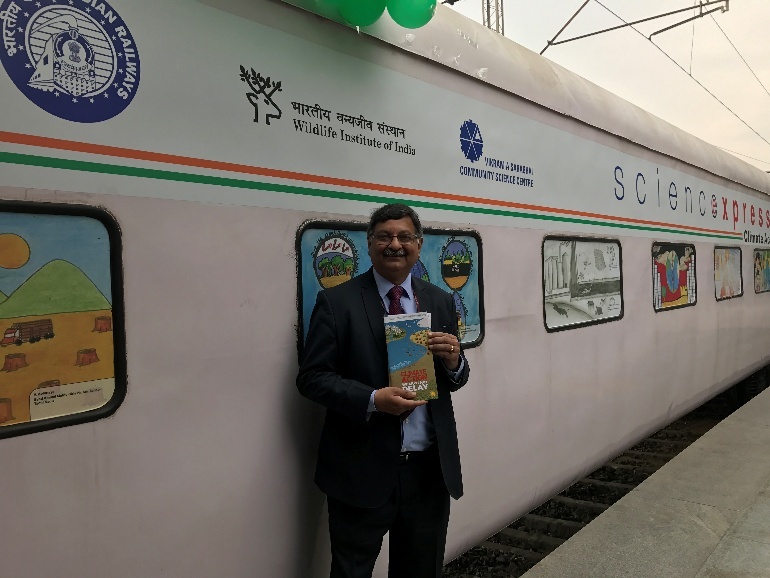 Phase V to VII was based on the theme of biodiversity and as ‘Science Express Biodiversity Special (SEBS)’, it showcased the rich biodiversity of India and its conservation measures. 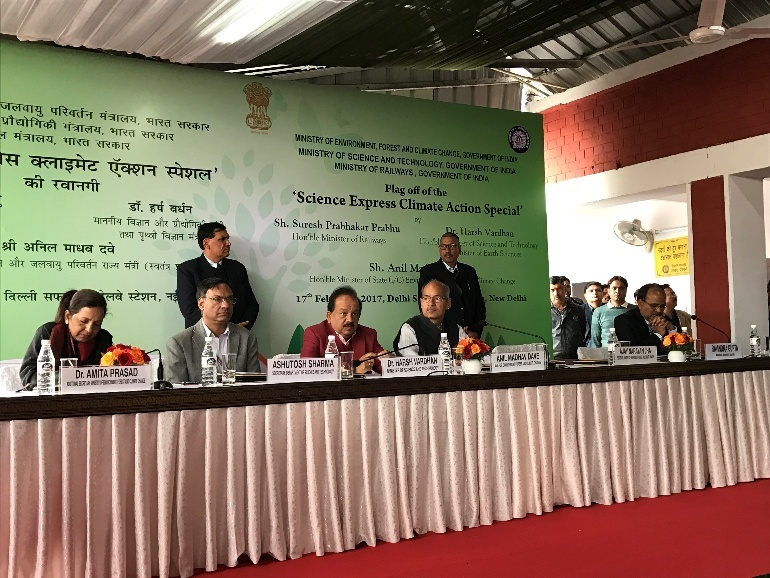 Phase VIII as ‘Science Express Climate Action Special (SECAS)’ was initiated highlight the global challenge of climate change and effective mitigation measures. 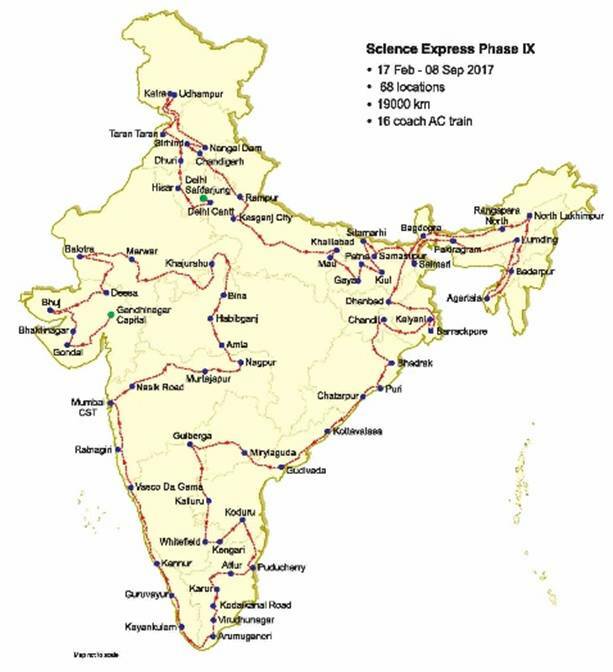 The ninth phase of the Science Express as SECAS II was flagged off on 17 February 2017 from Delhi Safdarjung Railway station at 11:00 am. 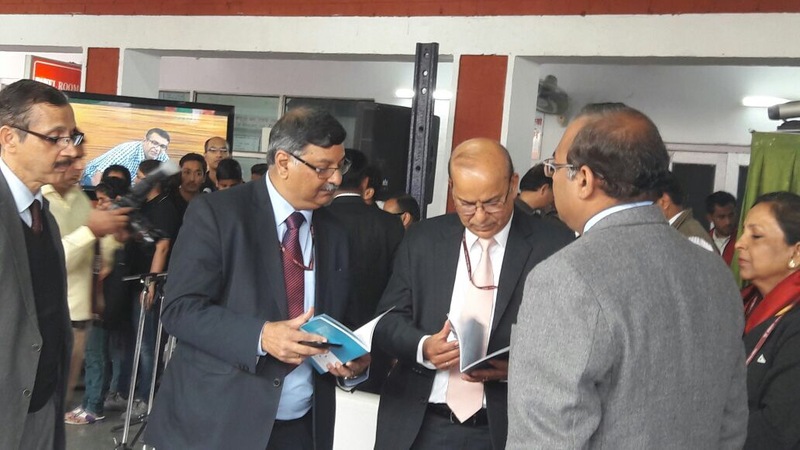 After the flag off on 18-19 February 2017, the SECAS was open for public viewing at Delhi Cantt. Railway Station embarking its journey across the country. The SECAS II is a unique collaborative initiative of Department of Science & Technology (DST), Ministry of Environment, Forest & Climate Change (MoEFCC), Department of Biotechnology (DBT), Ministry of Railways, Govt of India; Wildlife Institute of India (WII) and Vikram A Sarabhai Community Science Centre (VASCSC). The SECAS II will run over 19,000 km during which it will be exhibited at 68 stations across India from 17 February to 8 September 2017. Of the 16 coaches of SECAS, exhibition in 8 coaches developed by MoEFCC were exclusively devoted to information, case studies and material related to various aspect of climate change, the underlying science, impacts, adaptation activities, mitigation solutions and policy approaches in a manner that is easy to understand and interesting for not just school students but also the masses. In rest 8 coaches, there were exhibits and activities put up by DST and DBT. Three coaches of the train were fitted with solar panel on the rooftop. 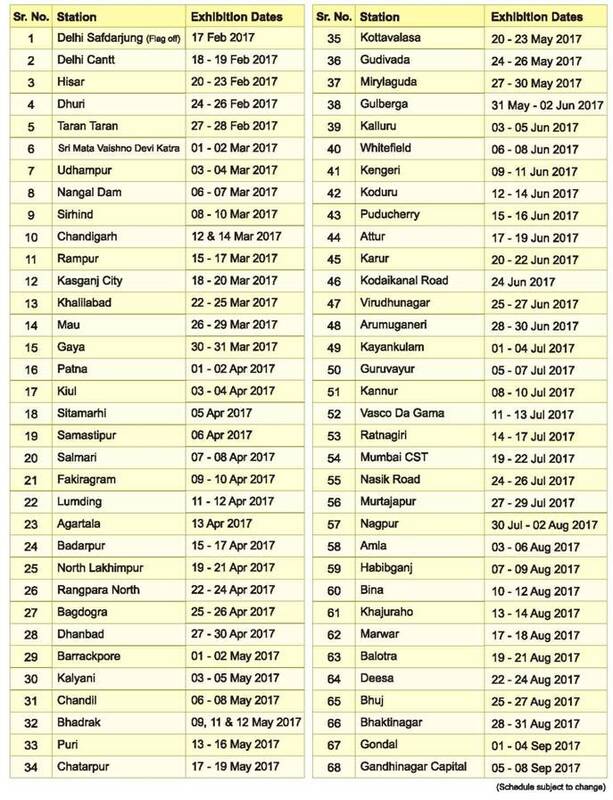 This year the train is going for the first time to Tripura, to North Lakhimpur and north bank of Brahmaputra. · Coach 7: International Negotiations for Climate Change - Introduction to UNFCCC, IPCC and internationally agreed action & targets. Explaining concept of equity and common but differential responsibility, Kyoto protocol & other key outcomes of major COP, Paris Agreement, etc. · Coach 8: Positive Actions - What can one do at school, on roads, at home and in offices and focus on concept of lifestyle choices with the key message ‘Increase your Handprint. Decrease your Footprint’. · Coach 11: Exhibition put up by the National Innovation Foundation (NIF) showcasing select innovations, demonstrating the ingenuity of common people and an innovative project which uses augmented reality techniques. Exhibition on themes like Innovations in S&T, Science Education, DST Scholarships & Schemes, Technologies for rural development, etc. · Coach 12: A Kids Zone is set up for children from Std. 4 and below to participate in fun-filled activities, games and puzzles in science, mathematics and environment. · Coach 13: The Joy of Science (JOS) Hands-on Lab in this coach is a space where students from Std. 5-10 can perform experiments and activities to understand concepts in environment, science and mathematics in an interesting manner. A training facility is also set up for orientation of teachers here. At each halt of SECAS, activities are planned to engage visitors across different age groups to reinforce its message. 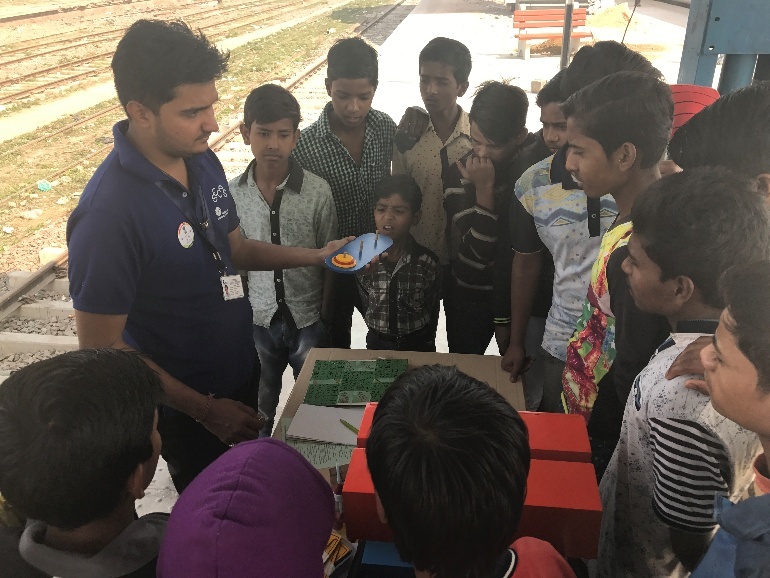 An exciting and much sought-after Outreach Programme is also conducted in local schools/institutions along with activities on the railway platforms. In addition, informative take-away material will be made available for wider distribution amongst schools and visitors. The exhibition is open to all but primarily targets students and teachers. More information is available on the website www.sciencexpress.in. For visit to the exhibition or any queries, please send an email to sciencexpress@gmail.com or contact the team aboard the train on 09428405407. School students can participate in the Joy of Science Lab in small batches of up to 20 students, by prior registration. Team SECAS solicits cooperation from all the concerned departments, media, institutions and individuals in giving wider publicity to this prestigious exhibition-on-wheels, so that a large number of visitors are benefited.